SD Huesca's Cucho Hernandez scored at Barcelona alongside Alex Gallar (AFP/Getty Images). Huesca will be looking to get back on track and continue what had been a promising start to their first ever La Liga campaign. Their 8-2 obliteration by Barcelona hurt as the Aragon side welcome bottom-of-the-table Rayo Vallecano to the El Alcoraz stadium for a historic, first ever home game in La Liga. 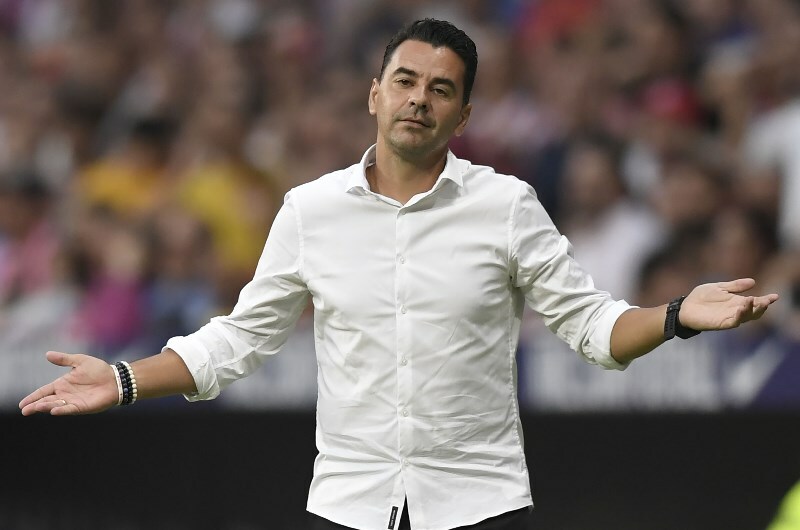 Huesca enjoyed a solid start to their first ever La Liga campaign, taking four points from their opening two fixtures on the road. A dream start of a 2-1 away win at Eibar was followed by a 2-2 draw away at Athletic Bilbao, which saw Huesca battle back from 2-0 down to grab a point. However, Huesca were brought down to earth with a 8-2 thrashing against the reigning La Liga champions. Cucho Hernandez grabbed a 3rd minute opening goal at the Camp Nou and Alex Gallar’s 42nd minute strike reduced the deficit to a respectable 3-2, but unfortunately for the newcomers it was downhill from there. On a positive note, Huesca have averaged two goals per game and hung on to strikers Cucho Hernandez on loan from Watford and Alex Gallar who has scored three goals in La Liga already. The Madrid club currently find themselves bottom of the table, but head coach and local idol Michel is unlikely to be panicking just yet. Rayo were well beaten in their season opener against Sevilla, going down 1-4 at home. Michel made some defensive adjustments ahead of their crosstown trip to face Atletico, and although Rayo lost 1-0 it was the visitors who enjoyed the greater possession and had more shots at goal. Rayo promoted Michel from youth coach to club manager in 2017, and he promptly got them promoted back to the top flight. 42-year old Michel played 350 games as a midfielder for Rayo, and is now managing the club he has been with since childhood. Manager Michel has a tough job making Rayo Vallecano competitive away from home (AFP/Getty Images). Rayo Vallecano lead Huesca 4-3 in the head-to-head match ups, meeting six times in the Segunda Division over three separate seasons with results evenly split at three wins apiece. Last season Huesca edged the corresponding fixture 2-1 in October 2017 with Cucho Hernandez scoring the winner. Huesca will be looking to follow the blueprint laid down by Eibar with a strong home record essential for survival. Huesca had the strongest home record in the Segunda Division last season, losing just twice with 13 wins and six draws. Rayo have faced two tough teams but their away record in La Liga is unconvincing. Luis Advíncula will be full of confidence after his goal for Peru against Germany and will be a danger down the right flank. Huesca will be playing their first ever home game in La Liga. Huesca have scored 2 goals in each of their 3 games this season (La Liga). Huesca had the best home record (W13 D6 L2) in the Segunda Division last season. Rayo Vallecano have lost 11 and drawn 7 of their last 18 away matches (La Liga). Rayo Vallecano have failed to keep a clean sheet in their last 18 away matches (La Liga). There’s little to split these two teams, but based off this being Huesca’s home debut in La Liga they are good value to win. We expect Huesca to win a hard-fought encounter and Alex Gallar to continue his good start to the season with another goal.